The 2nd generation Infinity M-series (Nissan designation Y34 and known as Nissan Gloria for the Japanese domestic market) was sold as the M45 in the US from 2003-2004 in very limited quantities. It is however a fantastic alternative to a Mercedes E-Class, Audi A6, Lexus GS, BMW 5-series and prices are really affordable today. 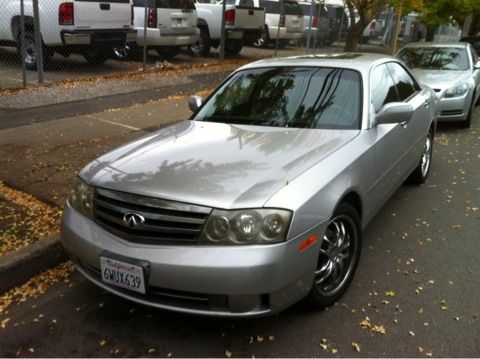 This 2003 Infiniti M45 is for sale in Burlingame, CA for $6500 via craigslist. As a 'car-guy' I get a fair number of requests from folks who are looking for a cheap but nice car to chauffeur clients around that is nicer than the basic economy car - this is it. The Y34 M45 is sleek enough to blend into the background (most non car folks won't notice its not a LexusedesMW) and rare enough that car people will do a double take. 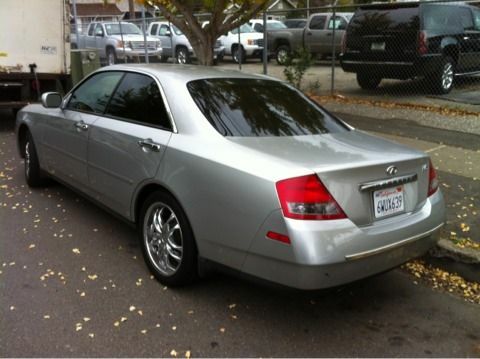 Less than 7000 of these handsome sedans were built during the Y34 generation's two year production run from 2003-2004. The M gets its power from the VK45DE, an all-alloy DOHC 4.5 liter V8 that puts out a respectable 340 horsepower and 333 ft-lbs of torque. Its not the fastest luxury sedan on the block, but its engine has enough grunt to push the 3800 lb chassis with some decent gusto via an automatic transmission. As a bonus surprise the Y34 has a relatively sophisticated suspension setup, with a rear-IRS that resembles the Y33 Nissan 350Z. 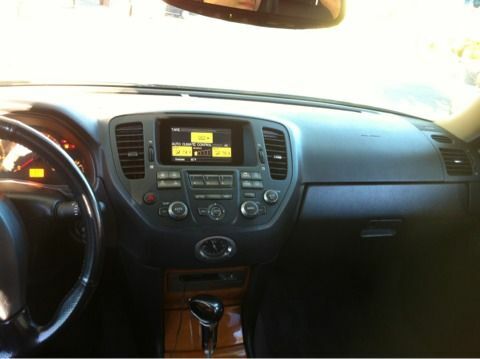 Expect it to drive/handle a bit like a heavy/soft G35 with a V8. A few caveats come with this feature - the early 2000s era Nissan's aren't known for their build quality or reliability (think 70s Citroen) so if you need something to commute 50 miles a day, expect to know your mechanic well, but there are examples that last more than 225k miles. However, if you keep the usage light and DIY the expensive maintenance, an M isn't a bad car for its price. We admit that the photos in this ad are sub-standard, and the car looks a bit odd in the rear 3/4 view; but in person its proportions and rear-end treatment really reminds us of an older Jaguar XJ - a good thing! and looks better than the new ones... at least to me. If it was nearer, I'd be checking it out.